S.T.E.A.M. Event at HES- April 23rd various activities from 5:15 pm - 7:00 pm - Click on this link for more info. *April 1st-12th -Little Caesar's Pizza Fundraiser-Delivery day will be April 30th. It’s time to round up all potential Pre-Kindergarten and “New to HES” Kindergarten students. Please visit the Hallettsville Elementary office at 308 North Ridge Street March 25-29 between 9:00 AM -2:00 PM to put your child on the list and obtain registration information. Any child who will turn 4 years old on or before September 1st, 2019 is a Pre-Kindergarten candidate. Any child who will turn 5 years old on or before September 1st, 2019 is a Kindergarten candidate. We are excited to meet our new little Brahmas. 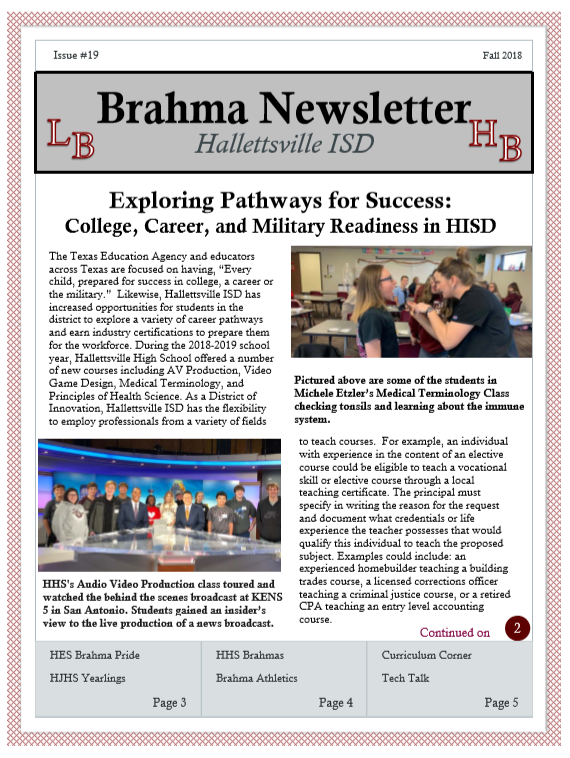 HES Spring 2018 Newsletter is now available! If you child will need to ride the bus this school year you must fill out the registration form and wait for confirmation from the Bus manager. Please click on this link and fill out the form. If you have any questions please call the office at 361-798-2242 ext 490. The HES office will be open Monday thru Friday from 7:30 am to 4:00 pm. When registering a new student you will need to provided the following: birth certificate, social security card, current shot record, proof of physical address (bill) and parent ID. If you have any questions please call the office at 361-798-2242 x 100. You may email me at mtargac@hisdbrahmas.org. Click on link for school supply lists.